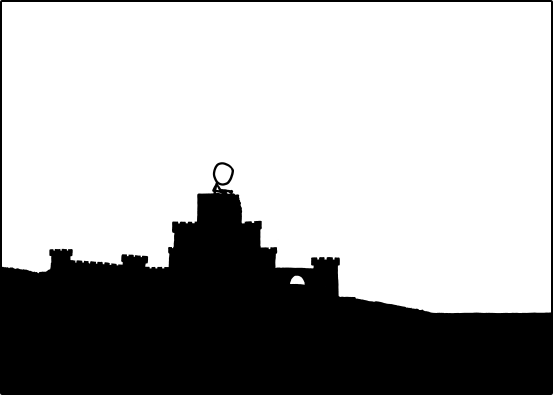 SadinaSaphrite wrote: Last panel Black Hat Guy rides a tsunami onto the castle, bearing a flag. After watching the .gif it looks like she's done most of the work including nearly all of the battlements. Maybe he just isn't very good at building sand castles? What if it never ends? I almost wonder if he's posting these to see how much of a backstory we, the fans, can come up with. Just to see how much we'll read into something as (seemingly) meaningless as two characters building a sandcastle. Just to see how nuts we'll get. Either way, he's doing a good job. Keep 'em coming. Officially this comic thread is the 2nd most commented on thread in xkcd history. Only because most of Pressures got moved to General and then locked. I am impressed it's surpassed Atheists though. I still think that was a better thread. Best ICT thread ever... that thing had some real, intellectually legitimate debate in it. This is already the most-viewed thread ever too, already topping Umwelt. One of the things I am curious about is what happens tomorrow? Will this end with the posting of the next comic? Will this continue playing and there won't be a next comic until this ends? Will there be a new comic *and* this continues to update? I think I am going to bookmark that wonderful gif by primis and have it as my home page. Last edited by TheMulattoMaker on Wed Mar 27, 2013 2:01 am UTC, edited 1 time in total. He's smoothing things out in their relationship, and trying to keep it all on the level. You forgot about the hurricane, flaming oil slick, and alligators upon which BHG rides.. I think it is a Robin Sparkles video. I'm waiting. I know I should rest. Big day tomorrow. Sigh. Can't leave the my desk now. It's like waiting for a birth with no delivery date required. Well let's see. 1095 posts, 92 frames. that gives roughly 12 posts per frame (or per half hour). Given this number, it would only take about 77 more frames (to 169), or about 38 more hours to reach the 2030 posts in pickup artist. Of course, pickup had over 8 days doing so, and we're already over half way there in less than 48 hours. that's gotta mean something. Back to topic, however. It seems to me that the 3rd dimension really is a factor, as he is standing on the 2nd level of the tower, but he's still behind the taller part he's working on, so who knows how wide or deep that chunk of sand really is. Back to her leaving, now. It was mentioned maybe she was leaving to get a camera or flag, but I thought of something else, too. We don't know the relationship of these two characters. They could have just been two people enjoying themselves who spontaneously decided to build a sandcastle together. The guy may have been interested in her, but had to leave for (as of yet) an unknown reason, but didn't want to seem like a jerk for just leaving, so he said 'later'. Of course, now, the girl, possibly not really caring much for him, didn't want him to get the wrong idea when she had to go for whatever reason, and didn't say anything. Then again, maybe they're siblings, so neither of their feelings might be hurt if they leave for whatever reason, but since they're family, they'll probably come back later, just like the guy did. who knows. This might be my second favorite comic, just after click and drag. It is rather cool. Perhaps it's his way of saying he's on holiday at the beach with his family; maybe the sequence of images will last until he gets back. It's certainly a good way to keep everyone paying attention if he has to miss a couple of updates. You understand, I hope, that this is the most off-topic post in the thread as yet? He's not as fast at crenellating as she is, is he? Is "crenellating" even a word? Such a huge change… or did I miss something? Last frame: Your princess is in another castle! April Fools! Truly epic comic. My guess is way to cheesy, but I had to say it. Is the speed of time in the comic changing, or is he this much slower at building than she is? Well now I've gone and finally registered. He's definitely slower then her, but now we know that it's going to be crenellated (Google says it's a real word). Maybe he's slow because he's not used to building sand castles. She was the one who initiated the castle building in the first place. So now the question is what happens 2 or 3 frames from now? It's 10:42 Eastern, and the Wednesday comic should post at Midnight. Do we get a Wednesday comic, and before that a conclusion to this one, or does this one keep running for another unknown (unknowable) number of half-hour frames? enumerated powers wrote: So now the question is what happens 2 or 3 frames from now? Just registered to say that this is the most amazing XKCD comic I've seen since Click and Drag. I wonder how long this is going to go on for, because we all have to sleep sometimes don't we? I bet the last slide is going to be the empty beach as the sand castle is washed away. NevadaWolf wrote: One of the things I am curious about is what happens tomorrow? That's half of the treat of this, isn't it? Last edited by LID919 on Tue Oct 16, 2018 8:45 pm UTC, edited 2 times in total. With the self-updating feature, I think people may miss a new comic because they won't refresh the page by themselves. pete3442 wrote: Is the speed of time in the comic changing, or is he this much slower at building than she is? But is the same amount of time always passing between each frame? Given the title of the comic, I would assume that perception and passage of time is meaningful here. Maybe the guy is not slower at building the castle, he is just more perceptive and absorbing more frames of the experience, causing his work to appear slower to us. If anyone wants to discuss this via IRC, I've created a channel for it: #xkcd-time on irc.foonetic.net. I'm enjoying all of this speculation. Oh me yarm he moved! This is awesome!